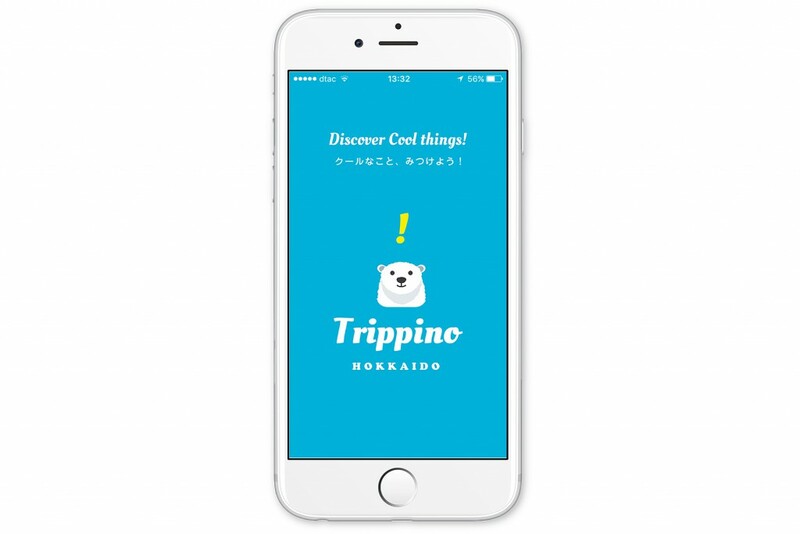 A Guide to the Sapporo Snow Festival in 2019 | Trippino HOKKAIDO - Discover cool things! 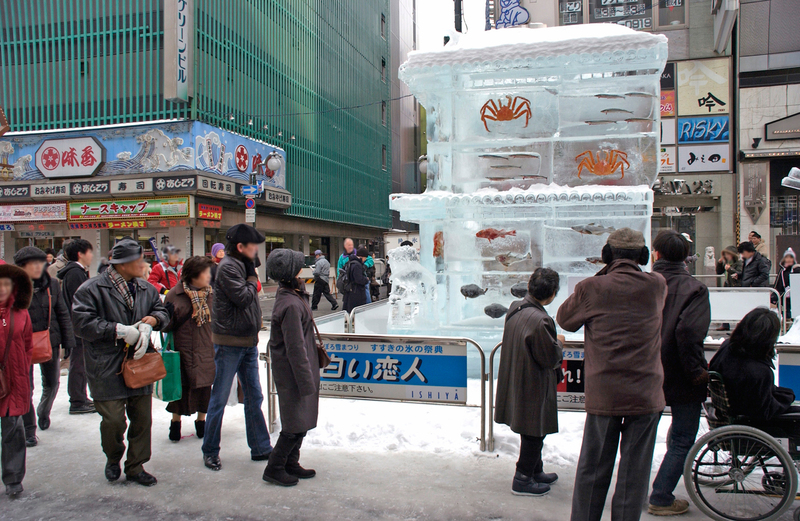 As many of you know, Sapporo is home to the annual Snow Festival that takes place in the winter. 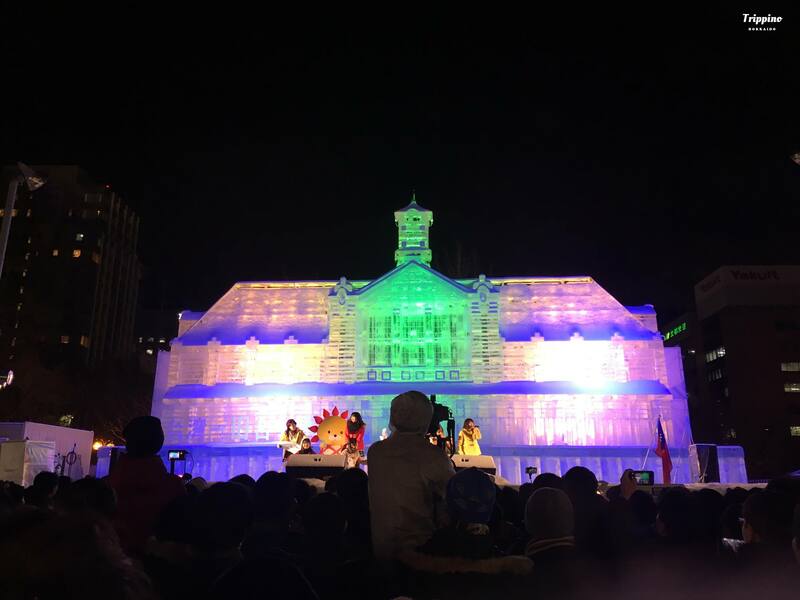 There are a lot of parts of the festival and it can be hard to find out about them, so in this blog we are breaking it all down in this easy guide to the Sapporo Snow Festival, specifically about the festival that will be taking place in February 2019. 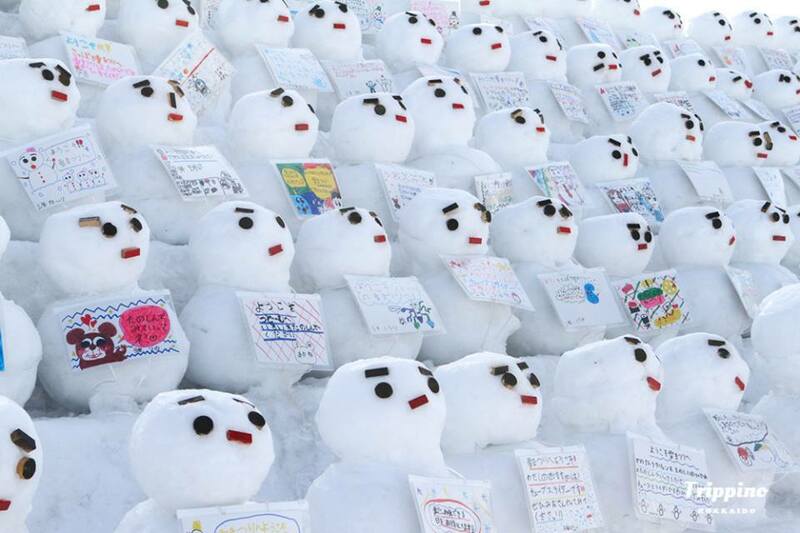 The Sapporo Snow Festival had originally started with local high school students making 6 snow statues in 1950, and unexpectedly turning this small event into a large one with about 50 thousand people visiting the event. This event turned into the big and well-known event in Sapporo for many years to come. The Self Defense Force joined the festival in 1955, participating in making a big snow sculpture. Eventually, the event quickly evolved from a local event into a massive festival, thanks to the many people who participated in making snow sculptures, the first nationwide media report about the festival in 1959, and then the massive international media coverage of the festival during 1972 when Sapporo hosted the Winter Olympic Games. Eventually the International Snow Sculpture Contest began; and many participants of this contest were from many different countries. The snow festival expanded and moved one of its locations to: the Tsudome site in 2009 to the present. 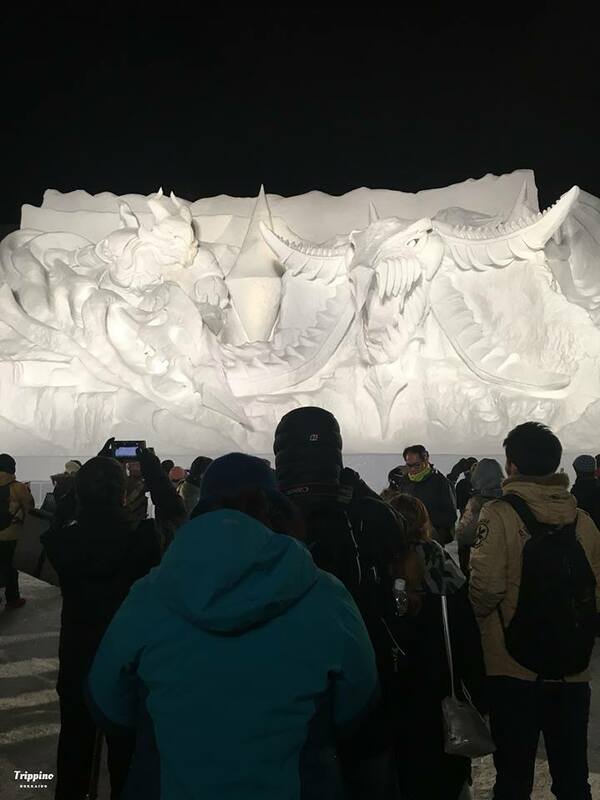 As you can see, the Sapporo Snow Festival isn’t only a local event for Hokkaido or Sapporo locals; it is a huge international event where many people from all over the world come to see these magnificent snow sculptures. 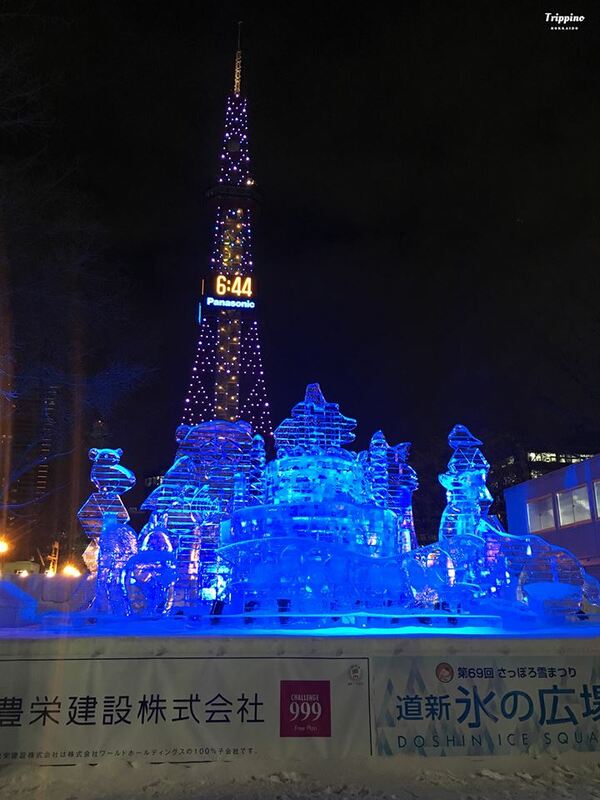 Where is the Sapporo Snow Festival Held? The Tsudome site in Sakaemachi located in the eastern part of Sapporo. With three sites with lots of activities and wintery events going on, you will be amazed by all there is to see at each of these places during the festival. This venue holds a giant, Christmas tree right in the middle, with an ice skating rink. This is the venue closest in distance to the Sapporo TV Tower. This venue annually has a big stadium built just for the festival, and regularly has many athletes who participate and show off their tricks and techniques on the stadium. They regularly hold events with skiing, snowboarding, and more! This is a great place to watch some winter sports in action. 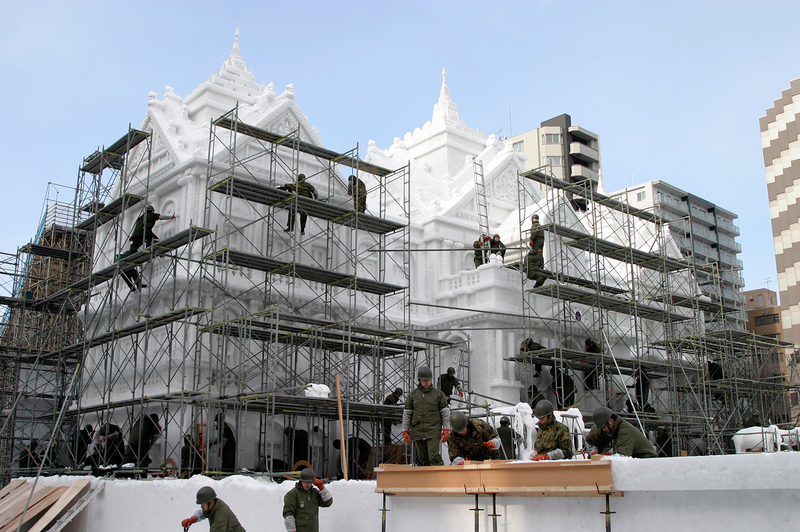 This venue usually holds a massive snow sculpture, one of the first ones you will see when wakling from 1 Chome Venue. 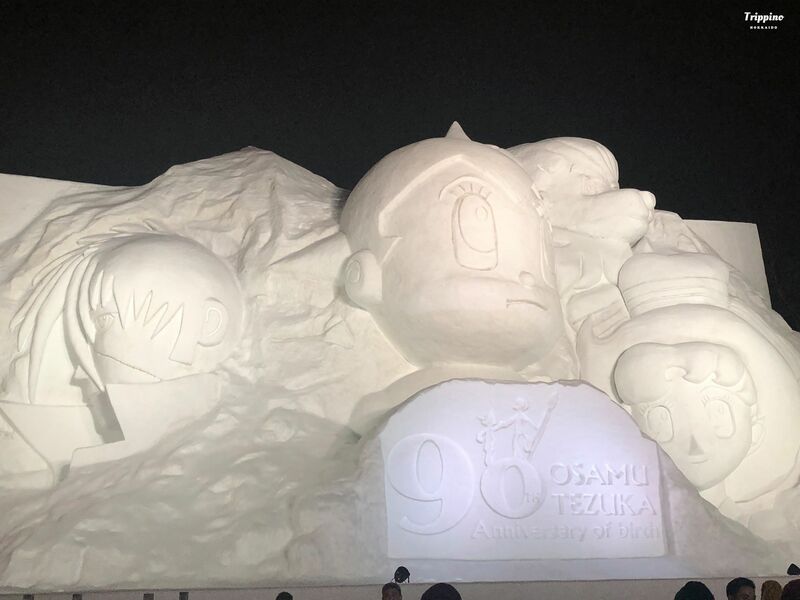 This year they are planning on making a big snow sculpture featuring two characters: Hatsune Miku from Vocaloid and Toyama Kasumi from a popular anime: BanG Dream! 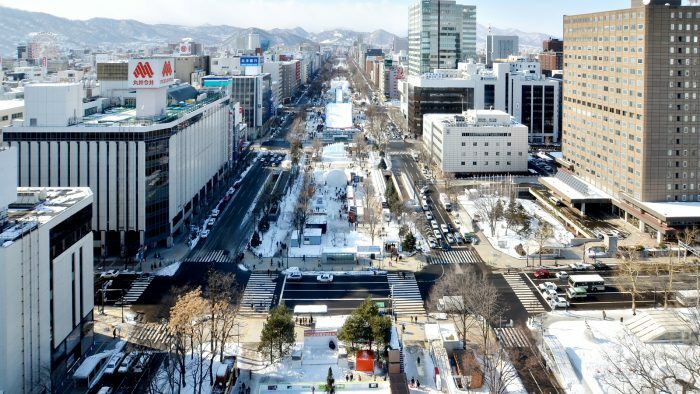 This venue usually holds another massive snow sculpture, this year in 2019 they are planning on exhibiting a giant snow sculpture called: ‘Run through Hokkaido! Thoroughbred’, and will depict people on horses passing by various landmarks of Hokkaido and Sapporo. This venue every year has a big ice sculpture right in the center of the square. This year’s ice sculpture will be an ice-replica of Mt. Yushan and Kaohsiung Station in Taiwan. This venue features various snow sculptures done by locals, including local high schools. One of the main ones they are featuring is a sculpture designed by Sapporo Hiragishi School of Design: Art Course. Additionally, this is the venue where all of the main food stalls are! Be sure to grab some tasty Hokkaido food and drinks while you are here. This venue also hosts a giant snow sculpture, usually accompanied with different shows on stage of the said sculpture every day, all throughout the day and night of the festival. This year, the snow sculpture they will be building here is the Helsinki Cathedral from Finland. This year this venue is planning on showcasing a large snow sculpture of a JR Freight Train representing the importance and representation of the JR (Japan Railways): the only cargo railway company in Japan that carries out daily transportation in Japan and in turns helps the Japanese economy. This sculpture represents the JR trains and how through JR, there are about 500 cargo trains that connect to 242 cargo stations nationwide. This venue features more various snow sculptures made and designed by locals from Sapporo and Hokkaido. One snow sculpture that is planned to be on display here will be representing and honoring the history and the culture of Hokkaido. This venue holds a giant snow sculpture in the venue. This year it will be featuring a snow sculpture showcasing characters from the popular movie: Star Wars Episode 9. This venue holds the international venue as well as the Snow Miku Exhibition Venue. In the international venue, nine teams from countries and regions around the world will participate and compete in a snow sculpture competition. You will be able to see the sculptures built here. The second half of the venue holds the annual Snow Miku Exhibition complete with Hatsune Miku and Vocaloid merchandise, because the character was created originally in Sapporo. This year is even more special because it is the official 10th anniversary of the Snow Miku exhibition in the Sapporo Snow Festival. This venue features more various snow sculptures made and designed by locals from Sapporo and Hokkaido. You can freely look at the sculptures anytime, however the light up period ends at 23:00. 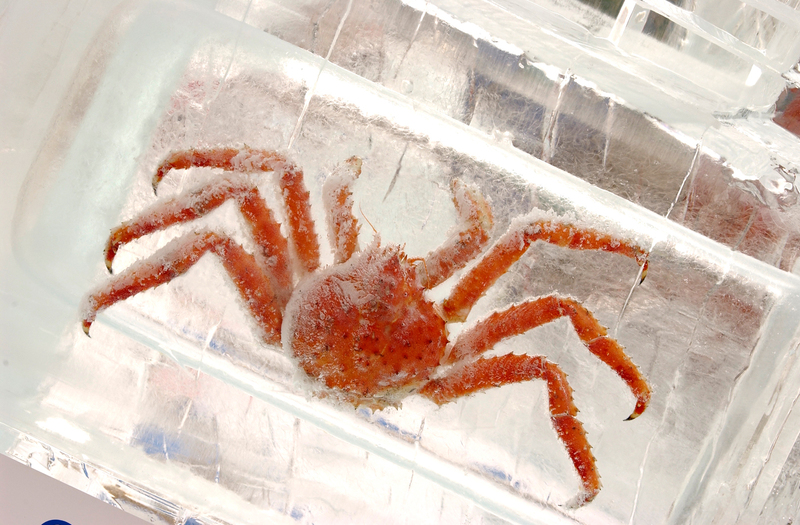 This is a great place to see a massive ice sculpture display, including sculptures that even have seafood incased in them such as crab. 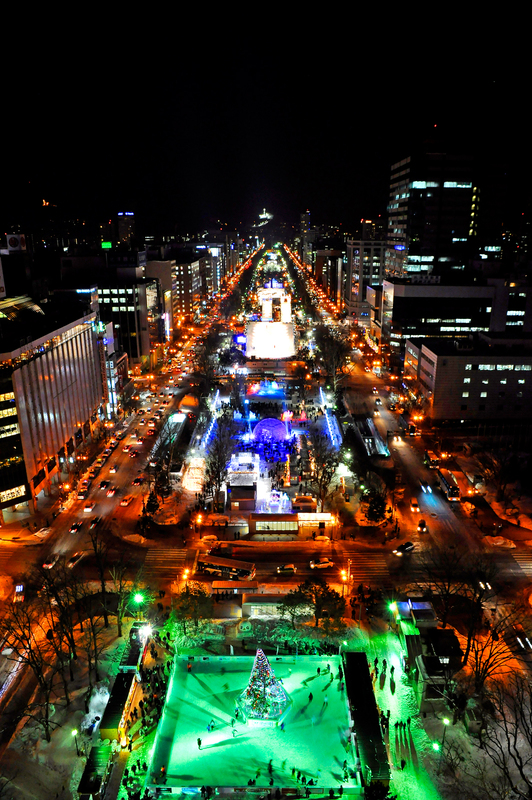 This site is where another part of the Sapporo Snow Festival is held. The Tsudome site is a community dome where kids to adults can enjoy many snow activities in the dome area! You can enjoy sledding outside, as well as enjoy some of the food stands/booths available and so much more. This place is an especially great place for kids with the amount of activities available. 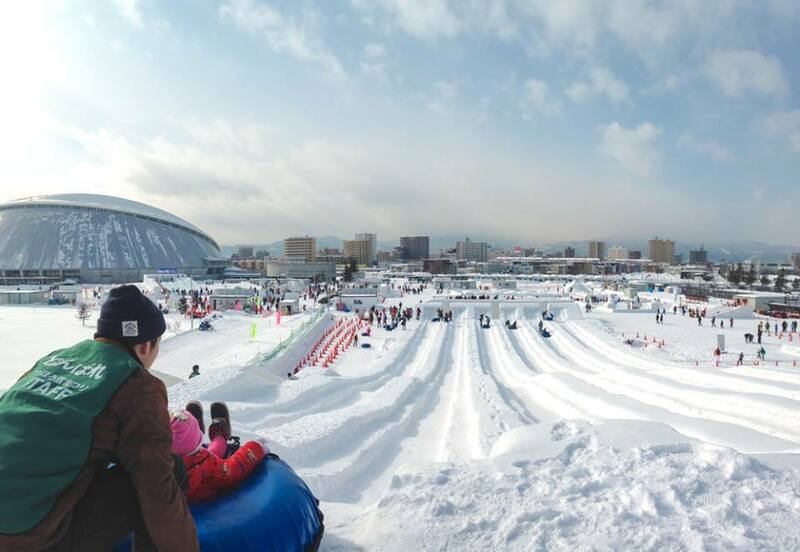 Come and enjoy Hokkaido’s winter and snow by playing outside here at the Tsudome. If you plan on going to the festival this year, we hope you have a pleasant and fun time.